You can never go wrong with a gleaming, delicate gold bangle on a bare arm. With this bracelet, choose from 14K white,yellow or rose gold with the exceptional addition of opulent shimmering diamonds. 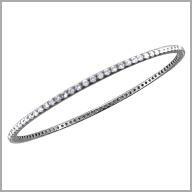 Featuring 96 full round cut diamonds circling the bangle in a single row, you'll never want to take it off. The total diamond weight is approximately 2.9952ct. The diamond color is G-H and the clarity grade is SI2.